On Dec. 15, Curiosity drilled its 19th sample at a location on the ridge called Rock Hall. On Jan. 15, the spacecraft used its Mars Hand Lens Imager (MAHLI) camera on the end of its robotic arm to take a series of 57 pictures, which were stitched together into this selfie. The "Rock Hall" drill hole is visible to the lower left of the rover; the scene is dustier than usual at this time of year due to a regional dust storm. Curiosity has been exploring the ridge since September of 2017. It's now headed into the "clay-bearing unit," which sits in a trough just south of the ridge. Clay minerals in this unit may hold more clues about the ancient lakes that helped form the lower levels on Mount Sharp. 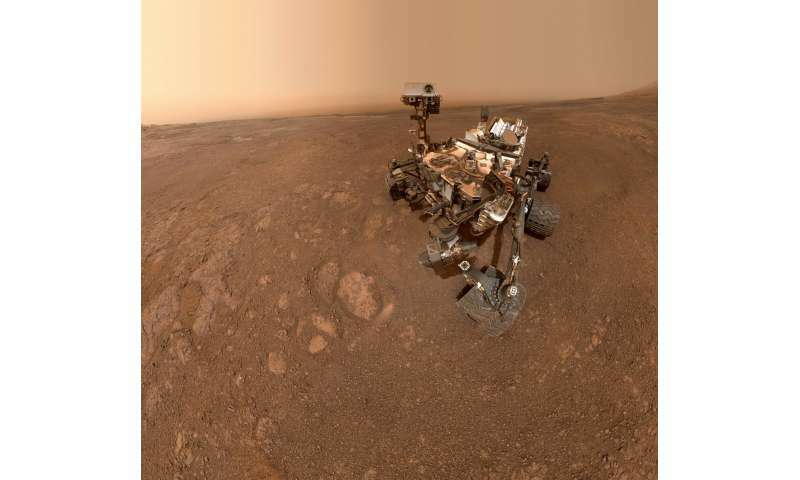 A boring photo of a "selfie", similar to all the other selfies of Curiosity. similar to all the other selfies of Curiosity. These 'selfies' are taken to judge the state of (dis)repair of the vehicle. In terms of publishing a pic a "rover and martian background" image is better than "just a martian background" image. If you think stuff is boring then just go somewhere else. No one is forcing you to look at images on the internet. No one cares what you find interesting or boring. You do not matter one bit to anyone on this planet. sec believes that Real Mars should look as hokey as the storybook covers of fake Mars he/she/it drools on with coweyes. How could you possibly know what I believe or don't believe? Are you my neighbor or my best friend? All you have are your own nasty opinions of people that you don't know and will probably never meet in person, because if you did, you would be much more careful with what you say about them on this internet website. The selfie photo is still boring, and it is only relevant to the NASA personnel who are assigned to find any problems with this rover. Other than that, the landscape would look far more interesting.